The teeth of a gift horse should never be examined too closely - consider the motor industry where different manufacturers often work together to each other's mutual benefit. Eden/Marshall seem to be excited so let's see what develops, but I can see how a company that needs direction and has other interests which are quite new, including a world wide distribution set-up, but has recently lost it's founder, it's guiding light, could benefit from a closer co-operation with a smaller company which has the technical stuff the bigger company needs but probably finds it difficult to establish its own line of production - the capital cost of establishing a manufacturing facility for the sort of toys we buy is not cheap.. this could be, I say could be, a win-win situation. It can be very costly to start up a new company, get the products built and then distributed. Marshall has those to offer to David. By the same token, the Founder has an impeccable reputation, product knowledge and new products that any company would be hard put to obtain. This could be a very healthy arrangement for both parties. Well, I'm waiting, with open ears! I talked to David and it is like I said. It is Edens job to announce the news. Hi -- David Nordschow here. I want to give you an update on a few things. 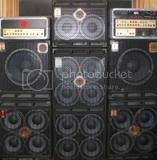 First of all I want to thank our customers who have been purchasing and playing through our Gene Pool speaker cabinets. We continue to hear great stories from the road, the clubs and recording studios. We'll keep making them so you can keep playing them. Second, I want to give you an update on the Gene Pool amp head. We've been getting some feedback from bass players who have been using our prototypes and as a result, I've been tweaking a few things to make it perform even better. We're in the final stages before full production and we expect to have them available in the first half of 2013. Finally, I want to share one other exciting development. Those who know me know that my passion is delivering great bass gear for musicians worldwide. So in addition to building the product line at Gene Pool, I have also been helping out my friends at Marshall Amplification. I've been collaborating with them to design some new speakers and cabinets for their small combos that you should see in 2013. Of course, my primary focus will continue to be on developing innovative bass gear at Gene Pool and hope that you will continue to show your support. +1 Good news from founder !!! Well - there you go - mutually beneficial! Thanks for dropping by David. And good news indeed. Still learning to play: MM Stingray5, NS CR5 eub, Lakland Joe Osborne sig 5. WT800, 210xlt, 410xlt, G-B Streamliner 900 and still getting up to no good in a kilt!